Cedar Key, Florida’s Main Ship Channel—No Ships, But Great Access to Some Excellent Fishing! In the 1880’s, steamships plied the waters between New Orleans, Havana, and Cedar Key. 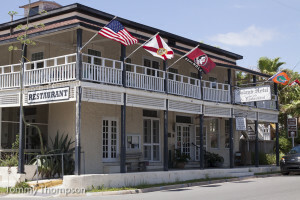 Yet after the hurricane of 1896 and the depletion of the cedar trees by pencil manufacturers, Cedar Key became a sleepy fishing village on Florida’s Big Bend. But in spite of the town’s loss of commerce and population, its main ship channel has remained active and useful to boaters, and especially anglers, but not to big coastal traders. The Main Ship Channel runs roughly south-southwest from its northern junction just south of the town of Cedar Key. Launching at either of the downtown public boat ramps gives you easy access to the turning basin and the channel. However, pay close attention to the tide and the height of your boat if you use the “inside” ramp, as the bridge is low and you may not clear it leaving the harbor. The outside ramp is a better choice for larger boats or boats with T-tops or towers. After a series of doglegs and switchbacks around Atsena Otie and Grassy keys, the channel straightens out, heading directly towards the lighthouse on Seahorse Key. At Marker #12, and on a moderate tide, anglers might consider making a slow northwest turn to fish the large grass flat between Seahorse Key and Deadmans Key. This is a particularly nice shallow grass bed that attracts lots of bait fish, which in turn attract trout, redfish and even Spanish mackerel in spring or fall. As you drift or pole past Deadmans Key, you’ll come to Deadmans Channel, a cut that drains the flat to the Gulf and is particularly fishy during falling water. Just remember to watch the tides and try not to get stuck outside the channel. For lures, try topwaters like MirrOlure Top Dogs in the shallows or D.O.A. Lures’ 3-inch shrimp, free-lined, into the deeper holes and into Deadmans Channel. At Marker #12, the Main Ship Channel takes a southerly turn. Another area worth investigating is the grassy flat south of Snake Key, due east of Marker #8. This area is slashed with numerous fingers of deep water, draining to or filling from the adjacent deep Gulf. If you drift here, fishing for seatrout, don’t forget to set out a live pinfish or pigfish under a cork, as the area is known for its lively cobia population. The last leg of the once-busy channel runs between West Bank and East Bank spoils and ends at marker #1. Here, you’re in open water, with Seahorse Reef to your west. 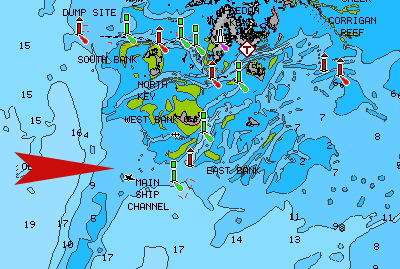 Most pleasure craft can navigate the top of the reef, but low water and wind can make it rough, especially down near the Steel Tower (marked Seahorse Reef Light on your charts) at the southern tip. From Marker #1, you’re in the open Gulf, and some careful exploring with your bottom finder will turn up some reefs and ledges, especially when you get into the 40-foot depths. Cedar Key’s location, close to deep water with live and limerock-encrusted bottom, ensures anglers that they don’t have to travel too far to find lots of nice amberjack, grouper and other reef fish. The Island Hotel in Cedar Key is a great place to hang out while fishing the area.